CAMINO Is The Best Metaphor For Living A Life Full Of Meaning! It is Memorial Day Weekend in USA and I am grateful for a new Facebook friendship of Paul and Deanna House. We hear many times that once you do the Camino you will CAMINO for the rest of your life and also it is said that once you do the Camino your REAL CAMINO BEGING…. The Camino is a powerful metaphor for all our JOURNEYS in LIfe. For me it is finding a way to share our God given gifts and talents working collaboratively together with others to find a way to make a difference in the world. Deanna and Paul House are doing this with their amazing project House In The Woods – Military & Family Retreat – “an outdoor retreat program that honors our veterans and their families’ sacrifices and assists them in their JOURNEY towards healing the mental and physical pain of loss”. When our country needed them, generations of brave men and women answered the call of duty to serve in our nation’s military. They sacrificed their family time, health, safety, and even their lives to protect ours. But with the return home, these soldiers bring with them life altering wounds and heartache which only their fellow brothers-in-arms can ever begin to understand. America can never restore what was lost, but at House in the Woods Military and Family Retreat, we offer an outdoor retreat program that honors their sacrifice and assists our veterans in the journey towards healing the mental and physical pain of loss. Paul House is the father of Sgt. Joel A. 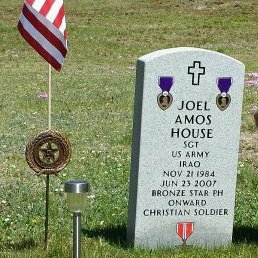 House w ho was killed on June 23, 2007 in Taji, Iraq by a roadside bomb. Paul has spent his life in the Maine woods, first as a woodsman and later as a Registered Maine Master Guide. Shortly after Joel was killed, the House family went to the 1st Cav Memorial Service at Fort Hood, TX. While there, Paul experienced first hand the comfort of being around other families who were going through the same loss and grief. From that moment, Paul knew in his heart that he wanted to start a program using the Maine outdoors as a venue to bring military families together to help one another get through their shared experiences and challenges from service and sacrifice to America’s Armed Forces. Deanna “Dee” House is the daughter of Master Chief-ret. Eaton E. Lothrop and Nancy Lothrop. Born at Portsmouth Naval Hospital in VA, first childhood memories are from Key West, FL where her father was stationed during the tense years of the Cuban Bay Missile Crisis. She currently teaches Spanish in two Eastern Maine high schools, Stearns in Millinocket and Schenk in East Millinocket. She is a UMaine, College of Education graduate student currently working towards her C.A.S. in Educational Administration. Her interests include writing and travel. House in the Woods’ mission is to create a therapeutic, recreational, and educational retreat for our nation’s U.S. armed forces and their families by using outdoor wilderness activities in Maine to create comfortable and relaxing milieu for veterans, active duty military, and their families to come together to share their common challenges which come from the service and sacrifice of protecting our nation’s freedom and cherished democratic ideals. This entry was posted in Acts Of Giving & Sharing, Camino Inspirations!, Camino Stories & Syncronicities and tagged camino, charitable acts of kindness, culture, outdoors, spirituality. Bookmark the permalink. ← Full Moon & Eclipse – Celebrate Your Positive Shift!